In recognition of the expanding trade partnership between Papua New Guinea and Australia, and the growing profile of Lae, the Australian Consulate-General in Lae began operating out of its temporary office yesterday, Monday 6 February 2017. The Australian High Commissioner Bruce Davis was onsite at the Lae International Hotel, as operations commenced at the temporary office. 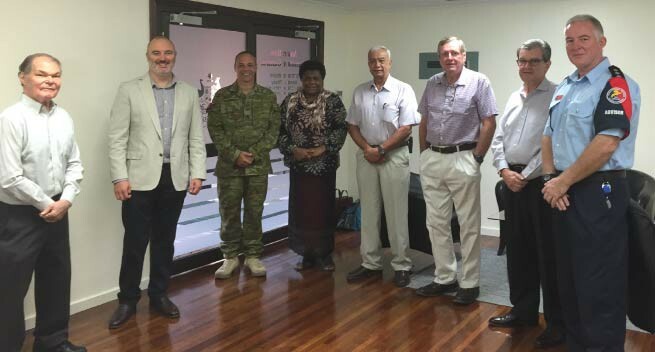 Also present were Acting Provincial Administrator Sheila Harou, Chief of Staff to the Morobe Governor Mala Ahi and representatives from the Australian Defence Force and Australian Federal Police based in Lae. High Commissioner Davis formally thanked Australia’s Honorary Consul Alan McLay and former Honorary Consul Phil Franklin for their service over many years to assist Australians on behalf of the Australian Government. With operations commencing at the temporary office, Australians living in Morobe will now be able to submit passport applications directly in Lae, saving the cost and time of sending applications via post to Port Moresby. The office will also provide consular assistance to Australians in Morobe Province. The temporary office will operate while work is underway to fit-out long-term office accommodation in Lae town, due for completion in mid-2017. “A key focus of the office will be to promote trade and investment between Australia and Papua New Guinea, noting the importance of Lae as a strategic hub which connects the Momase, Highlands and Islands regions with the rest of the world,” said Australia’s Consul-General to Lae, Paul Murphy. Already Australian investment in Papua New Guinea is over K40 billion and is set to grow across services, resources and agriculture sectors as the Papua New Guinea-Australia economic partnership continues to strengthen.